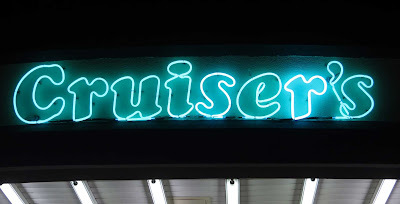 The ZehnKatzen Times: [Out122ndWay] Cruiser's Cafe's Neon Is Back! [Out122ndWay] Cruiser's Cafe's Neon Is Back! 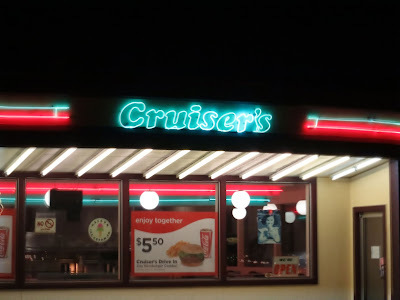 Cruiser's Cafe is a totally adorable diner out past 122nd on SE Division; precisely speaking, it's on the southwest corner of SE 136th and Division. 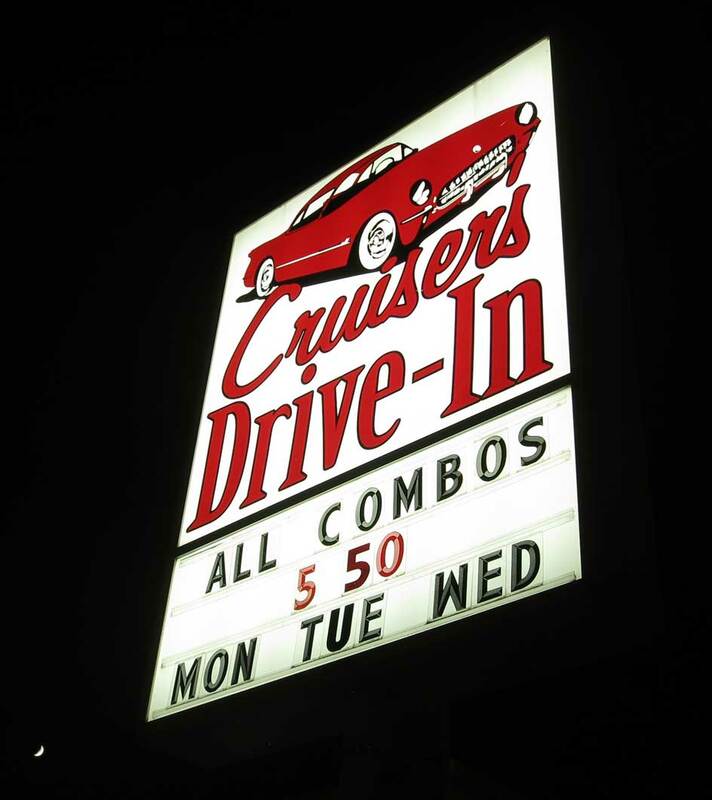 It's been there about forty years, since the 80s, and for all that time, it's served its own version of the classic American burger-joint dependables: burgers, cheesburgers, fries, tater tots, patty melts, and the rest, and some unexpected things too: The Wife™ says the deep-friend shrimp there are divine. Big portions, reasonable prices. Can't lose here, really. What they've been missing is the neon on the outside. It's been visible, and visibly, sadly broken. 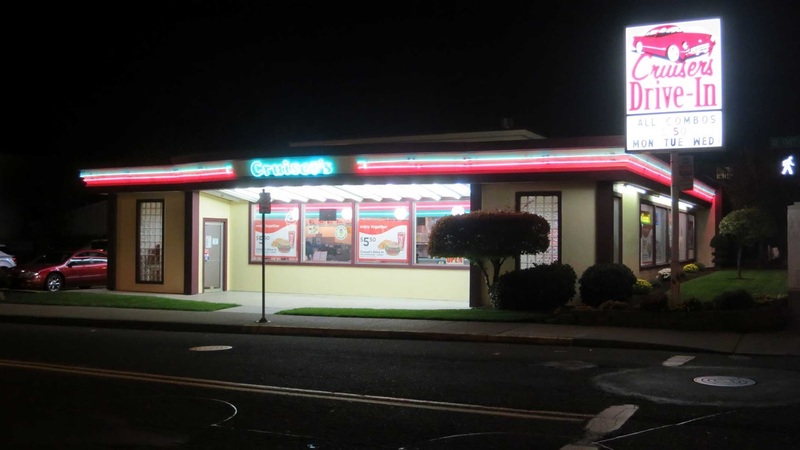 This last evening, as we came homeward bound on Division, though, we saw it … shining out in the night like an oasis to the weary diner lover. 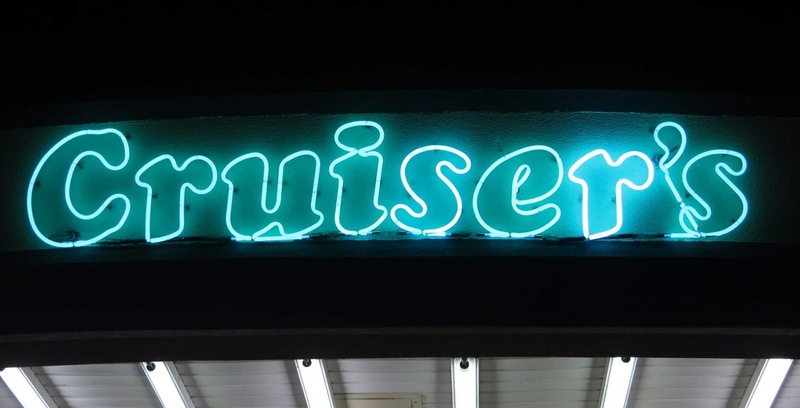 The neon has at last been repaired. There are two levels of hot-pink-and-teal stripe; one along the roofline outside, and another along the ceiling line, inside. Both were working and simply beautiful from the street. The most attractive thing to me, was the type. Looks like Cooper Black Italic; it's chunkiness gives it that old-school American diner feel. I took snaps while Wife™ stepped in for a vanilla soft-serve cone, which we shared … which was superb as well. She chatted up whoever was in the building; she said they said they've been working on the funding for this for about eight months now. Money and time well spent, I'd say.